Vintage Robin Aran sweater knitting pattern leaflet # 15339. Womens collar cardigan sweater with lacy details on sleeve edge and lower part of sweater. Bust 28/30 - 32/34 - 36/38 - 40/42". Original knitting pattern not a copy. Includes only the pattern not the completed item. 100's more listed. Inventory box 13. 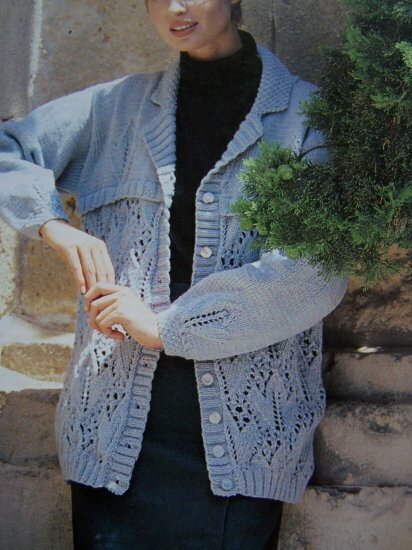 Pattern name: Robin Trojan Aran sweater leaflet # 15339. ~~ NOTE ~~ Pattern looks like new, no writing. Large 2 page about 8 1/2 x 11" size card stock type pattern. Measurements: To fit Bust or chest 28 - 42". Actual size ( loose fitting style) 41 - 53.5". Full Length 27 - 28.5". Length of sleeve 15.5 - 18". S & H to Canada $3.00 mailed flat. Ask about combined shipping.